Studies in Reading and Book Culture is a book series intended to include monographs and article collections on the history and sociology of book culture, authorship, reading, writing, printing, publishing, and book preservation. If you're interested in publishing your book in the series, please contact Dr. Ivo Volt, the Editor-in-Chief of the University of Tartu Press, at Ivo.Volt@ut.ee. Vol. 1. William A. Kelly, Jürgen Beyer (eds. 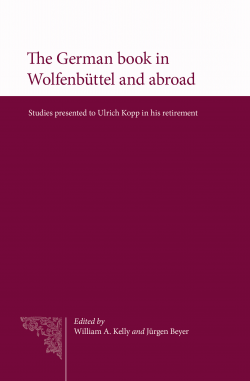 ), The German book in Wolfenbüttel and abroad. Studies presented to Ulrich Kopp in his retirement. 2014. 344 p. ISBN 978-9949-32-494-1 (print). The essays in the volume study books, woodcuts and manuscripts from the fifteenth to the seventeenth centuries, they discuss printers and printing techniques, trace the provenance of library holdings, edit sources and add to the bibliographical registration of the period’s book production. Vol. 2. Marju Lauristin, Peeter Vihalemm (eds. ), Reading in changing society. 2014. 210 p. ISBN 978-9949-32-575-7 (print), 978-9949-32-578-8 (online). 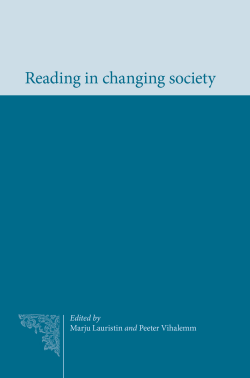 The changing state of reading and its fate in the digitalised world is one of the core issues in the contemporary debates about the future of culture. The central position of the printed word, and primarily, books as the most valuable cultural medium and the main source of knowledge, are becoming questioned in the age of the Internet. Reading as gateway to the world of fantasies has been challenged by powerful audiovisual media. Is the pleasure of reading as a creative process involving imagination and self-cognition disappearing, and being replaced by the quick exchange of impressions and images in social media? Are these critical notes and concerns about the future of reading just rapid generalisations and misunderstandings, evoked by the invasion of new technologies in the old and well-established world of books? The articles gathered here represent empirical studies, theoretical and historical reflections on the changes in the world of books and reading in the Baltic and Nordic countries, as well as descriptions of the new library practices that reflect the creative efforts to adapt to the changing social and technological environment.